Even the best “high quality” dark roasts can make an acidic cup of coffee, though cheaper blends are notorious for being overly acidic. And acid can be hard on a sensitive stomach, particularly if you enjoy more than one cup of coffee a day. So how does baking soda improve an acidic cup of Joe? Beyond using it as a natural cleaning agent to remove stains for your coffee pot, some believe that baking soda can actually improve the taste of coffee. It’s no secret that coffee can be a tad acidic. But for many, giving up their morning cup of coffee is not an option. And truthfully, with science continuing to study coffee and the many benefits it provides, it’s easy to see why coffee lovers would never want to give up their morning cup of brew. Yet, if drinking coffee is contributing to excess stomach acid and causing you digestive upset, then you’re probably thinking you’d be better off without. Think again. 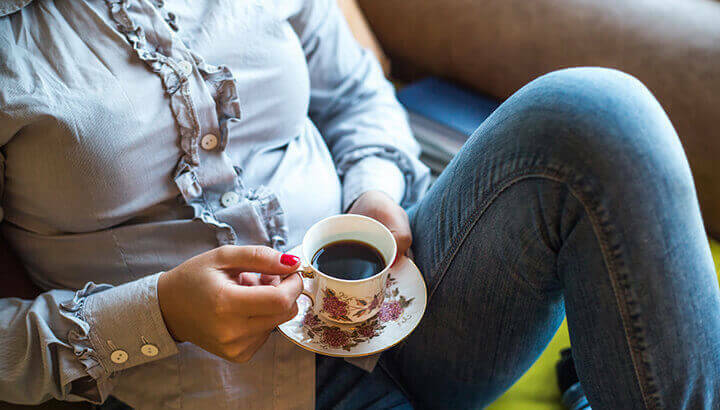 According to Harvard Health, coffee drinking is associated with a lower risk of depression among women, a lower risk of fatal prostate cancer among men, and a lower risk of stroke among both men and women. Human and animal studies show some protection against Alzheimer’s disease and a lower risk for some cancers like estrogen-negative breast cancer. Coffee has a pH of five, and baking soda can help neutralize it. Acidity is something that’s measured on the pH scale, which uses 7.0 as an indicator of neutrality. So, numbers under seven as are naturally more acidic than numbers above seven. For instance, according to Science Buddies, battery acid is zero. Clearly, that’s highly acidic. Lemon juice registers at about two, and black coffee registers at a pH of about five. But rather than kicking your “acidic” coffee habit — and there are clearly good reasons to keep drinking coffee — why not neutralize the acid in your brew? In water, baking soda is mildly alkaline and can be used to neutralize acid. That’s why, when it dissolves in water, it works well as a natural antacid remedy. Its alkalinity is also why it makes a great deodorizer — by countering slightly acidic scent molecules. On the pH scale baking soda registers as a nine. That means by simply adding a little baking soda to your coffee you could neutralize the acid to avoid stomach upset. There’s two way you can do that. You can add about a quarter teaspoon to your coffee beans for a pot of coffee, or you can add just a pinch (small pinch) to your cup of coffee. Research shows that baking soda can counteract acid reflux. Both caffeinated and decaffeinated coffee exacerbate gastroesophageal reflux according to a German study. However, coffee creates more reflux than simply caffeine added to water. This suggests that other components of coffee contribute to acid reflux. A small pinch of baking soda can help counteract acid reflux. Gout is a form of inflammatory arthritis, according to the Arthritis Foundation. It develops in some people who have high levels of uric acid in the blood. The acid can form painful needle-like crystals in a joint and cause severe episodes of pain, tenderness, redness, warmth and swelling. Due to baking soda’s pH neutralizing effects, it may help lower uric acid levels. According to GoutDiet.org baking soda introduced to the blood alkalinizes it, causing the uric acid structures to break up. Then, they can easily filter out the kidneys and expel through the urine. Add a pinch to your coffee or more as needed. Since baking soda neutralizes stomach acid, it can help make coffee drinking more bearable if you suffer from a stomach ulcer. Add a quarter to a half teaspoon to your coffee grounds. Most of the baking soda in America comes from Wyoming. 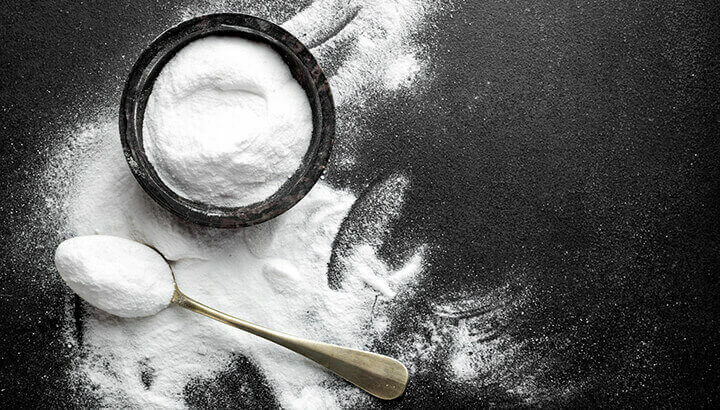 While most of us often keep a box baking soda in the house for baking, as a deodorizer for the fridge, or as a natural cleaning alternative (and now for neutralizing acidic coffee), some still aren’t sure what exactly baking soda is. So, let’s break it down. Baking soda, also known as sodium bicarbonate, is a chemical salt that occurs naturally as the mineral nahcolite. This is a soft, colorless or white carbonate mineral. Nahcolite was first described in 1928 when it was found in a lava tunnel at Mount Vesuvius, Italy. NaHCO3, as it’s known chemically, contains sodium (NA), hydrogen (H) and carbonate (CO). So, where does America get its baking soda from? Well, most baking soda in the U.S. comes from Green River, Wyoming. According to Arm & Hammer, the baking soda from Green River is mined from trona ore. Trona deposits were molded over four million years ago after the evaporation of great salt lakes in Wyoming. Trona also comes from Kenya, Egypt, Venezuela and the deserts of Central Asia. After it’s mined, it’s heated to make soda ash, which is then dissolved in water. When carbon dioxide bubbles under pressure through the solution, sodium bicarbonate is formed. Now that you know all about baking soda, let’s talk about how to use it properly. Although larger quantities of baking soda have been used to remedy indigestion, in much the same way antacids are used, you can still go overboard and risk side effects. Drinking baking soda is like drinking salt water. It’s extremely high in sodium and will raise your blood pressure. And too much sodium is linked to kidney and heart issues in healthy people. And of course, too much baking soda in your coffee can leave you with a less than tasty cup that leaves you with a soapy taste in your mouth. Generally, to reduce the acidic nature of coffee, just a small pinch is all you need. Enjoy! Hey Buddy!, I found this information for you: "4 Benefits Of Adding Baking Soda To Your Coffee". Here is the website link: https://www.thealternativedaily.com/benefits-of-baking-soda-in-coffee/. Thank you.